Save money + energy. Use a setback thermostat to lower your home's temperature automatically while you're away. What is a Setback Thermostat? Thermostats control heating and cooling appliances in houses. A setback thermostat gives the user the option of changing the temperature setting automatically at night and also during the work day when the occupants have left the house. A setback thermostat can help reduce overall household energy consumption. A conventional thermostat simply regulates house heating at one temperature. For instance, in the winter, if you set the thermostat to 20°C (68°F), it will activate the heating system when the house temperature drops below 20°C and will shut the system off when the house air warms up past 20°C. A setback thermostat contains an electronic clock. It can automatically turn down the temperature setting at night, when you are asleep, or during the day, when you are at work. It can also return the temperature to a more comfortable level before you wake up or arrive home from work. That way, you can have the energy savings of a lowered thermostat setting without the discomfort of having to wait for the house to heat up again. The setback thermostat can also be used as a set-forward thermostat for an air-conditioning system. It can allow the house to heat up when it is unoccupied and return it to a comfortable temperature before occupants return from daytime activities. Although this About Your House deals with setback thermostats and forced-air heating systems generally, you can apply some of the advice to electric baseboards or to summer usage. You can use a standard thermostat to set your house temperature lower during times when the house is unoccupied. This will lead to similar energy savings as with a setback thermostat but without the convenience. What Is a Normal House Temperature? CMHC randomly surveyed Canadian houses. 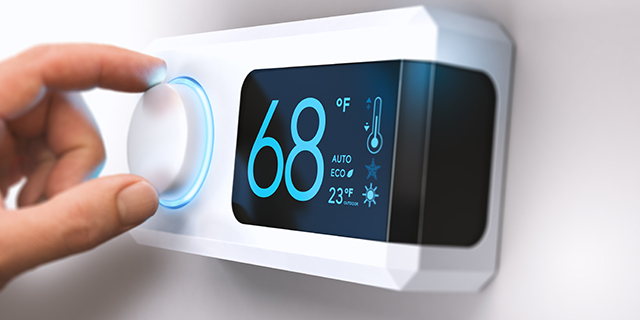 Thermostat settings in the winter tend to be quite closely grouped around 20°C – 21°C (68°F – 70°F). Summer temperatures range much more widely, depending upon whether the house has air conditioning. To What Temperature Should I Set Back the Thermostat? The more you reduce the thermostat setting, the greater the possibility for savings. Generally, a drop of 2°C (3.6°F) will lead to some savings and little risk. Some householders reduce temperatures 4°C – 6°C (7°F – 11°F). However, temperature differences this large create potential comfort and moisture problems that are discussed below. Yes. Research from the Canadian Centre for Housing Technology shows that winter setbacks for the houses tested would result in heating cost savings of five to fifteen per cent. The highest savings came with a setback of 6°C (11°F). Note that these savings are for two airtight, well-insulated, unoccupied houses. The savings in your home may vary but are likely to be in the same range. There are several potential problems. The first one relates to comfort. A cool house can be uncomfortable in the winter. If you wake up at night before the time the thermostat resets to 20°C or 22°C (68°F or 71°F), the rooms will be cooler. The same applies if you have a setback daily when you leave for work, but you return home earlier. A setback schedule works best for people with predictable work and sleep periods. If your schedule is completely irregular, you might as well simply turn down a conventional thermostat when you sleep or leave the house, rather than trying to anticipate it with a setback thermostat. A second problem is the possibility of high humidity in the winter. Cool air can hold less moisture than warm air, so the relative humidity (RH) rises as the air cools. For instance, house air at a reasonable 35 per cent RH at 22°C (71°F) will see an increase to 50 per cent RH when the same air is allowed to cool to 16°C (61°F). This can lead to condensation on windows and walls (for instance, in closets or behind furniture). Basically, you are creating a more humid environment, all things considered, when you allow the house temperature to drop significantly. This may not be a problem in a dry house or one where you can modify the humidity, for instance by turning off a humidifier. House humidity should be monitored, especially in the winter. For more information on how to measure humidity in houses, see CMHC’s About Your House fact sheet Measuring Humidity in Your Home. Window condensation will be the first sign of excessive house humidity. Blinds and curtains usually increase the occurrence of condensation. If condensation is taking place, make sure that you wipe it up diligently or raise the temperature setback (for example, from 16°C to 17°C [61°F to 63°F]) until you have lowered house humidity levels and condensation is no longer a problem. A third potential problem is a sustained lack of air circulation as the house cools down. If you set back your thermostat in the evening from 20°C to 16°C (68°F to 61°F), the house may not cool to 16°C until 5 a.m. During that time, there will be no furnace circulation fan operation, unless you set the fan to run continuously. For houses where bedroom doors are kept closed, this could lead to stuffiness in those rooms and a lack of fresh air. There are ventilation devices and furnace fan cycling controls that can compensate for this, if you find bedrooms and other rooms underventilated during setback periods. Setting back to a higher temperature, such as 18°C (64°F), will reduce the period of furnace inactivity (and your consequent savings). Setting the furnace fan to run continuously will help, but this will increase electricity consumption. See About Your House: How to Get the Ventilation That You Need in Your House for more information. The final potential problem with setback thermostats is the time required to regain temperature, or to heat the house up once more. An oversized furnace will return the house to the higher temperature quickly, but a properly sized furnace can take a long time — as much as one hour — to bring the house back to a comfortable temperature. You have to experiment with this, as it will depend on the type and relative size of your heating equipment and your home’s energy efficiency, as well as other factors. If it takes an unacceptably long time for your house to heat up again, consider a smaller setback or start the high temperature setting earlier so that it is comfortable for you when you get out of bed or return from work. Related to this problem is the length of time required for the room enclosure and furnishings to heat up. If your bathroom has cooled to 16°C (61°F) overnight and the furnace has kicked in at 6 a.m. to bring up the heat, your bathroom walls will still be cool when you start a shower at 7 a.m. Testing in the research house at the Canadian Centre for Housing Technology showed that it takes up to several hours for wall temperatures to return to their highest levels. Cool wall surface temperatures can lead to comfort and condensation problems. What Houses Have the Greatest Risk for Problems? Many houses will not see significant problems with the use of setback thermostats, but some are more at risk. If you have a house with moisture problems in the winter (mold, condensation on windows, and so on), get those problems fixed before you consider installing a setback thermostat or set back your conventional thermostat. If you have a forced-air furnace and closed bedroom doors, you will need to ensure adequate ventilation of bedrooms at night, one way or another. If you already keep your house at an unusually low temperature (such as 18°C [64°F]), then a temperature setback is more likely to get you into the high humidity danger zone. So, How Do You Set These Things Anyhow? You may find electronic thermostats confusing, especially when compared to the simplicity of an older dial thermostat. Because each system is different, we can’t help you with this. Check your manual or ask someone who is familiar with setback thermostats to help you. All These Problems — Is it Worth the Trouble? Yes, it can be worth the trouble. If your house is in good condition, if you do not have excessive moisture problems, if you have a fairly regular schedule, then by all means use a setback thermostat. It will save energy. Just be aware that all energy-saving activities can have unexpected results, such as those outlined in this article, and be sure to take steps to avoid these problems.